This command imports the accounts from a Double-entry or Income & Expenses file (*.ac2) or a text file (*.txt), and integrates them automatically in the existing Chart of accounts. When there are cost centers, these will also be carried forward. When this option is activated, all new accounts are added to the accounting plan. If already existing accounts are imported, but with different descriptions, the existing descriptions are replaced by the imported ones when this option is activated. 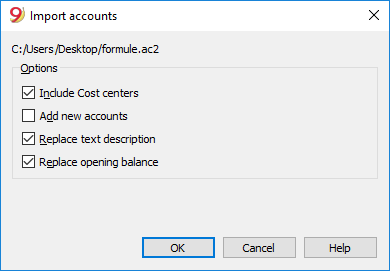 If already existing accounts are imported with different opening balances, the existing opening balances are replaced by the imported ones when this option is activated.